The cause of most brain tumors is unknown. Uncommon risk factors include inherited neurofibromatosis, exposure to vinyl chloride, Epstein–Barr virus and ionizing radiation. Studies on mobile phone exposure have not shown a clear risk. The most common types of primary tumors in adults are meningiomas (usually benign) and astrocytomas such as glioblastomas. In children, the most common type is a malignant medulloblastoma. Diagnosis is usually by medical examination along with computed tomography (CT) or magnetic resonance imaging (MRI). The result is then often confirmed by a biopsy. Based on the findings, the tumors are divided into different grades of severity. Treatment may include some combination of surgery, radiation therapy and chemotherapy. Anticonvulsant medication may be needed if seizures occur. Dexamethasone and furosemide may be used to decrease swelling around the tumor. Some tumors grow gradually, requiring only monitoring and possibly needing no further intervention. Treatments that use a person's immune system are being studied. Outcome varies considerably depending on the type of tumor and how far it has spread at diagnosis. Glioblastomas usually have very poor outcomes, while meningiomas usually have good outcomes. The average five-year survival rate for all brain cancers in the United States is 33%. Secondary, or metastatic, brain tumors are about four times more common than primary brain tumors, with about half of metastases coming from lung cancer. Primary brain tumors occur in around 250,000 people a year globally, making up less than 2% of cancers. In children younger than 15, brain tumors are second only to acute lymphoblastic leukemia as the most common form of cancer. In Australia, the average lifetime economic cost of a case of brain cancer is $1.9 million, the greatest of any type of cancer. The signs and symptoms of brain tumors are broad. People with brain tumors will experience them regardless of whether the tumor is benign (not cancerous) or cancerous. Primary and secondary brain tumors present with similar symptoms, depending on the location, size, and rate of growth of the tumor. For example, larger tumors in the frontal lobe can cause changes in the ability to think. However, a smaller tumor in an area such as Wernicke's area (small area responsible for language comprehension) can result in a greater loss of function. Headaches as a result of raised intracranial pressure can be an early symptom of brain cancer. However, isolated headache without other symptoms is rare, and other symptoms often occur before headaches become common. Certain warning signs for headache exist which make it more likely to be associated with brain cancer. These are as defined by the American Academy of Neurology: "abnormal neurological examination, headache worsened by Valsalva maneuver, headache causing awakening from sleep, new headache in the older population, progressively worsening headache, atypical headache features, or patients who do not fulfill the strict definition of migraine". The brain is divided into 4 lobes and each lobe or area has its own function. A tumor in any of these lobes may affect the area's performance. The location of the tumor is often linked to the symptoms experienced but each person may experience something different. Frontal lobe tumors may contribute to poor reasoning, inappropriate social behavior, personality changes, poor planning, lower inhibition, and decreased production of speech (Broca's area). Temporal lobe: Tumors in this lobe may contribute to poor memory, loss of hearing, difficulty in language comprehension (Wernicke's area). Parietal lobe: Tumors here may result in poor interpretation of languages and difficulty speaking, difficulty writing, drawing, naming, and recognizing, and poor spatial and visual perception. Brain stem: Tumors on this can cause seizures, induce endocrine problems, respiratory changes, visual changes, headaches and partial paralysis. Despite the personality and behavior changes that occur in people with brain tumors, little research on such changes has been done. A person's personality may be altered due to the tumor damaging lobes of the brain. 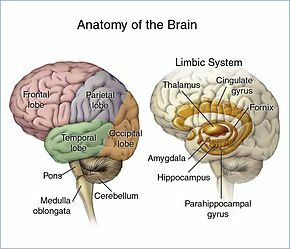 Since the frontal, temporal, and parietal lobes control inhibition, emotions, mood, judgement, reasoning, and behavior, a tumor in that region can cause inappropriate social behavior, temper tantrums, laughing at things which merit no laughter, and even psychological symptoms such as depression and anxiety. Epidemiological studies are required to determine risk factors. Aside from exposure to vinyl chloride or ionizing radiation, there are no known environmental factors associated with brain tumors. Mutations and deletions of tumor suppressor genes, such as P53, are thought to be the cause of some forms of brain tumor. Inherited conditions, such as Von Hippel–Lindau disease, multiple endocrine neoplasia, and neurofibromatosis type 2 carry a high risk for the development of brain tumors. People with celiac disease have a slightly increased risk of developing brain tumors. Although studies have not shown any link between cell phone or mobile phone radiation and the occurrence of brain tumors, the World Health Organization has classified mobile phone radiation on the IARC scale into Group 2B – possibly carcinogenic. Discounting claims that current cell phone usage may cause brain cancer, modern, third-generation (3G) phones emit, on average, about 1% of the energy emitted by the GSM (2G) phones that were in use when epidemiological studies that observed a slight increase in the risk for glioma – a malignant type of brain cancer – among heavy users of wireless and cordless telephones were conducted. Human brains are surrounded by a system of connective tissue membranes called meninges that separate the brain from the skull. This three-layered covering is composed of (from the outside in) the dura mater ("hard mother"), arachnoid mater ("spidery mother"), and pia mater ("tender mother"). The arachnoid and pia are physically connected and thus often considered as a single layer, the pia-arachnoid, or leptomeninges. Between the arachnoid mater and the pia mater is the subarachnoid space which contains cerebrospinal fluid (CSF). This fluid circulates in the narrow spaces between cells and through the cavities in the brain called ventricles, to nourish, support, and protect the brain tissue. Blood vessels enter the central nervous system through the perivascular space above the pia mater. The cells in the blood vessel walls are joined tightly, forming the blood–brain barrier which protects the brain from toxins that might enter through the blood. Tumors of the meninges are meningiomas and are often benign. Primary tumors of the glial cells are called gliomas and often are malignant by the time they are diagnosed. The pons is a specific region in the brainstem that consists of myelinated axons much like the spinal cord. The thalamus and hypothalamus of the diencephalon also consist of neuron and glial cell tissue with the hypophysis (pituitary gland) and pineal gland (which is glandular tissue) attached at the bottom; tumors of the pituitary and pineal gland are often benign. The medulla oblongata is at the start of the spinal cord and is composed mainly of neuron tissue enveloped in oligodendrocytes and meninges tissue. The spinal cord is made up of bundles of these axons. Glial cells such as Schwann cells in the periphery or, within the cord itself, oligodendrocytes, wrap themselves around the axon, thus promoting faster transmission of electrical signals and also providing for general maintenance of the environment surrounding the cord, in part by shuttling different compounds around in response to injury or other stimulus. Although there is no specific or singular symptom or sign, the presence of a combination of symptoms and the lack of corresponding indications of other causes can be an indicator for investigation towards the possibility of an brain tumor. Brain tumors have similar characteristics and obstacles when it comes to diagnosis and therapy with tumors located elsewhere in the body. However, they create specific issues that follow closely to the properties of the organ they are in. The diagnosis will often start by taking a medical history noting medical antecedents, and current symptoms. Clinical and laboratory investigations will serve to exclude infections as the cause of the symptoms. Examinations in this stage may include the eyes, otolaryngological (or ENT) and electrophysiological exams. The use of electroencephalography (EEG) often plays a role in the diagnosis of brain tumors. Brain tumors, when compared to tumors in other areas of the body, pose a challenge for diagnosis. Commonly, radioactive tracers are uptaken in large volumes in tumors due to the high activity of tumor cells, allowing for radioactive imaging of the tumor. However, most of the brain is separated from the blood by the blood-brain barrier (BBB), a membrane which exerts a strict control over what substances are allowed to pass into the brain. Therefore, many tracers that may reach tumors in other areas of the body easily would be unable to reach brain tumors until there was a disruption of the BBB by the tumor. Disruption of the BBB is well imaged via MRI or CT scan, and is therefore regarded as the main diagnostic indicator for malignant gliomas, meningiomas, and brain metastases. Swelling or obstruction of the passage of cerebrospinal fluid (CSF) from the brain may cause (early) signs of increased intracranial pressure which translates clinically into headaches, vomiting, or an altered state of consciousness, and in children changes to the diameter of the skull and bulging of the fontanelles. More complex symptoms such as endocrine dysfunctions should alarm doctors not to exclude brain tumors. A bilateral temporal visual field defect (due to compression of the optic chiasm) or dilation of the pupil, and the occurrence of either slowly evolving or the sudden onset of focal neurologic symptoms, such as cognitive and behavioral impairment (including impaired judgment, memory loss, lack of recognition, spatial orientation disorders), personality or emotional changes, hemiparesis, hypoesthesia, aphasia, ataxia, visual field impairment, impaired sense of smell, impaired hearing, facial paralysis, double vision, or more severe symptoms such as tremors, paralysis on one side of the body hemiplegia, or (epileptic) seizures in a patient with a negative history for epilepsy, should raise the possibility of a brain tumor. CT scan of a brain tumor, with its diameters marked as an X. There is hypoattenuating (dark) peritumoral edema in the surrounding white matter, with a "finger-like" spread. Medical imaging plays a central role in the diagnosis of brain tumors. 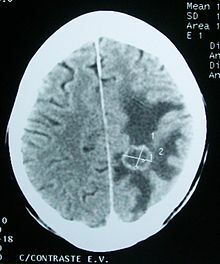 Early imaging methods – invasive and sometimes dangerous – such as pneumoencephalography and cerebral angiography have been abandoned in favor of non-invasive, high-resolution techniques, especially magnetic resonance imaging (MRI) and computed tomography (CT) scans, though MRI is typically the reference standard used. Neoplasms will often show as differently colored masses (also referred to as processes) in CT or MRI results. Benign brain tumors often show up as hypodense (darker than brain tissue) mass lesions on CT scans. On MRI, they appear either hypodense or isointense (same intensity as brain tissue) on T1-weighted scans, or hyperintense (brighter than brain tissue) on T2-weighted MRI, although the appearance is variable. Contrast agent uptake, sometimes in characteristic patterns, can be demonstrated on either CT or MRI scans in most malignant primary and metastatic brain tumors. Pressure areas where the brain tissue has been compressed by a tumor also appear hyperintense on T2-weighted scans and might indicate the presence a diffuse neoplasm due to an unclear outline. Swelling around the tumor known as peritumoral edema can also show a similar result. This is because these tumors disrupt the normal functioning of the BBB and lead to an increase in its permeability. More recently, advancements have been made to increase the utility of MRI in providing physiological data that can help to inform diagnosis and prognosis. Perfusion Weighted Imaging (PWI) and Diffusion Weighted Imaging (DWI) are two MRI techniques that reviews have been shown to be useful in classifying tumors by grade, which was not previously viable using only structural imaging. However, these techniques cannot alone diagnose high- versus low-grade gliomas, and thus the definitive diagnosis of brain tumor should only be confirmed by histological examination of tumor tissue samples obtained either by means of brain biopsy or open surgery. The histological examination is essential for determining the appropriate treatment and the correct prognosis. This examination, performed by a pathologist, typically has three stages: interoperative examination of fresh tissue, preliminary microscopic examination of prepared tissues, and follow-up examination of prepared tissues after immunohistochemical staining or genetic analysis. Tumors have characteristics that allow determination of malignancy and how they will evolve, and determining these characteristics will allow the medical team to determine the management plan. Anaplasia or dedifferentiation: loss of differentiation of cells and of their orientation to one another and blood vessels, a characteristic of anaplastic tumor tissue. Anaplastic cells have lost total control of their normal functions and many have deteriorated cell structures. Anaplastic cells often have abnormally high nuclear-to-cytoplasmic ratios, and many are multinucleated. Additionally, the nuclei of anaplastic cells are usually unnaturally shaped or oversized. Cells can become anaplastic in two ways: neoplastic tumor cells can dedifferentiate to become anaplasias (the dedifferentiation causes the cells to lose all of their normal structure/function), or cancer stem cells can increase their capacity to multiply (i.e., uncontrollable growth due to failure of differentiation). Atypia: an indication of abnormality of a cell (which may be indicative for malignancy). Significance of the abnormality is highly dependent on context. Neoplasia: the (uncontrolled) division of cells. 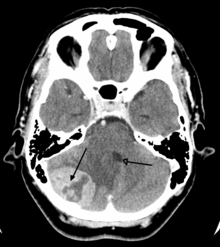 As such, neoplasia is not problematic but its consequences are: the uncontrolled division of cells means that the mass of a neoplasm increases in size, and in a confined space such as the intracranial cavity this quickly becomes problematic because the mass invades the space of the brain pushing it aside, leading to compression of the brain tissue and increased intracranial pressure and destruction of brain parenchyma. Increased intracranial pressure (ICP) may be attributable to the direct mass effect of the tumor, increased blood volume, or increased cerebrospinal fluid (CSF) volume, which may, in turn, have secondary symptoms. Tumors can be benign or malignant, can occur in different parts of the brain, and may be classified as primary or secondary. A primary tumor is one that has started in the brain, as opposed to a metastatic tumor, which is one that has spread to the brain from another area of the body. The incidence of metastatic tumors is approximately four times greater than primary tumors. Tumors may or may not be symptomatic: some tumors are discovered because the patient has symptoms, others show up incidentally on an imaging scan, or at an autopsy. Grading of the tumors of the central nervous system commonly occurs on a 4 point scale (I-IV) created by the World Health Organization in 1993. Grade I tumors are the least severe and commonly associated with long term survival, with severity and prognosis worsening as the grade increases. Low grade tumors are often benign, while higher grades are aggressively malignant and/or metastatic. Other grading scales do exist, many based upon the same criteria as the WHO scale and graded from I-IV. Secondary tumors of the brain are metastatic and have invaded the brain from cancers originating in other organs. This means that a cancerous neoplasm has developed in another organ elsewhere in the body and that cancer cells have leaked from that primary tumor and then entered the lymphatic system and blood vessels. They then circulate through the bloodstream, and are deposited in the brain. There, these cells continue growing and dividing, becoming another invasive neoplasm of the primary cancer's tissue. 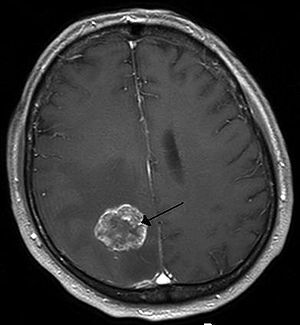 Secondary tumors of the brain are very common in the terminal phases of patients with an incurable metastasized cancer; the most common types of cancers that bring about secondary tumors of the brain are lung cancer, breast cancer, malignant melanoma, kidney cancer, and colon cancer (in decreasing order of frequency). Secondary brain tumors are more common than primary ones; in the United States there are about 170,000 new cases every year. Secondary brain tumors are the most common cause of tumors in the intracranial cavity. The skull bone structure can also be subject to a neoplasm that by its very nature reduces the volume of the intracranial cavity, and can damage the brain. anaplasia: the cells in the neoplasm have an obviously different form (in size and shape). Anaplastic cells display marked pleomorphism. The cell nuclei are characteristically extremely hyperchromatic (darkly stained) and enlarged; the nucleus might have the same size as the cytoplasm of the cell (nuclear-cytoplasmic ratio may approach 1:1, instead of the normal 1:4 or 1:6 ratio). Giant cells – considerably larger than their neighbors – may form and possess either one enormous nucleus or several nuclei (syncytia). Anaplastic nuclei are variable and bizarre in size and shape. Primary brain tumors generally are invasive (i.e. they will expand spatially and intrude into the space occupied by other brain tissue and compress those brain tissues); however, some of the more malignant primary brain tumors will infiltrate the surrounding tissue. In 2016, the WHO restructured their classifications of some categories of gliomas to include distinct genetic mutations that have been useful in differentiating tumor types, prognoses, and treatment responses. Genetic mutations are typically detected via immunohistochemistry, a technique that visualizes the presence or absence of a targeted protein via staining. Anaplastic astrocytoma, Astrocytoma, Central neurocytoma, Choroid plexus carcinoma, Choroid plexus papilloma, Choroid plexus tumor, Dysembryoplastic neuroepithelial tumour, Ependymal tumor, Fibrillary astrocytoma, Giant-cell glioblastoma, Glioblastoma multiforme, Gliomatosis cerebri, Gliosarcoma, Hemangiopericytoma, Medulloblastoma, Medulloepithelioma, Meningeal carcinomatosis, Neuroblastoma, Neurocytoma, Oligoastrocytoma, Oligodendroglioma, Optic nerve sheath meningioma, Pediatric ependymoma, Pilocytic astrocytoma, Pinealoblastoma, Pineocytoma, Pleomorphic anaplastic neuroblastoma, Pleomorphic xanthoastrocytoma, Primary central nervous system lymphoma, Sphenoid wing meningioma, Subependymal giant cell astrocytoma, Subependymoma, Trilateral retinoblastoma. Surgery: complete or partial resection of the tumor with the objective of removing as many tumor cells as possible. Chemotherapy: a treatment option for cancer, however, it is not always used to treat brain tumors as the blood-brain barrier can prevent some drugs from reaching the cancerous cells. A variety of experimental therapies are available through clinical trials. Survival rates in primary brain tumors depend on the type of tumor, age, functional status of the patient, the extent of surgical removal and other factors specific to each case. The primary and most desired course of action described in medical literature is surgical removal (resection) via craniotomy. Minimally invasive techniques are becoming the dominant trend in neurosurgical oncology. The main objective of surgery is to remove as many tumor cells as possible, with complete removal being the best outcome and cytoreduction ("debulking") of the tumor otherwise. In some cases access to the tumor is impossible and impedes or prohibits surgery. Several current research studies aim to improve the surgical removal of brain tumors by labeling tumor cells with 5-aminolevulinic acid that causes them to fluoresce. Postoperative radiotherapy and chemotherapy are integral parts of the therapeutic standard for malignant tumors. Radiotherapy may also be administered in cases of "low-grade" gliomas when a significant tumor reduction could not be achieved surgically. Multiple metastatic tumors are generally treated with radiotherapy and chemotherapy rather than surgery and the prognosis in such cases is determined by the primary tumor, and is generally poor. The goal of radiation therapy is to kill tumor cells while leaving normal brain tissue unharmed. In standard external beam radiation therapy, multiple treatments of standard-dose "fractions" of radiation are applied to the brain. This process is repeated for a total of 10 to 30 treatments, depending on the type of tumor. This additional treatment provides some patients with improved outcomes and longer survival rates. Radiotherapy is the most common treatment for secondary brain tumors. The amount of radiotherapy depends on the size of the area of the brain affected by cancer. Conventional external beam "whole-brain radiotherapy treatment" (WBRT) or "whole-brain irradiation" may be suggested if there is a risk that other secondary tumors will develop in the future. Stereotactic radiotherapy is usually recommended in cases involving fewer than three small secondary brain tumors. Radiotherapy may be used following, or in some cases in place of, resection of the tumor. Forms of radiotherapy used for brain cancer include external beam radiation therapy, the most common, and brachytherapy and proton therapy, the last especially used for children. People who receive stereotactic radiosurgery (SRS) and whole-brain radiation therapy (WBRT) for the treatment of metastatic brain tumors have more than twice the risk of developing learning and memory problems than those treated with SRS alone. Patients undergoing chemotherapy are administered drugs designed to kill tumor cells. Although chemotherapy may improve overall survival in patients with the most malignant primary brain tumors, it does so in only about 20 percent of patients. Chemotherapy is often used in young children instead of radiation, as radiation may have negative effects on the developing brain. The decision to prescribe this treatment is based on a patient's overall health, type of tumor, and extent of the cancer. The toxicity and many side effects of the drugs, and the uncertain outcome of chemotherapy in brain tumors puts this treatment further down the line of treatment options with surgery and radiation therapy preferred. UCLA Neuro-Oncology publishes real-time survival data for patients with a diagnosis of glioblastoma multiforme. They are the only institution in the United States that displays how brain tumor patients are performing on current therapies. They also show a listing of chemotherapy agents used to treat high-grade glioma tumors. Genetic mutations have significant effects on the effectiveness of chemotherapy. Gliomas with IDH1 or IDH2 mutations respond better to chemotherapy than those without the mutation. Loss of chromosome arms 1p and 19q also indicate better response to chemoradiation. A shunt may be used to relieve symptoms caused by intracranial pressure, by reducing the build-up of fluid (hydrocephalus) caused by the blockage of the free flow of cerebrospinal fluid. The prognosis of brain cancer depends on the type of cancer diagnosed. Medulloblastoma has a good prognosis with chemotherapy, radiotherapy, and surgical resection while glioblastoma multiforme has a median survival of only 12 months even with aggressive chemoradiotherapy and surgery. Brainstem gliomas have the poorest prognosis of any form of brain cancer, with most patients dying within one year, even with therapy that typically consists of radiation to the tumor along with corticosteroids. However, one type, focal brainstem gliomas in children, seems open to exceptional prognosis and long-term survival has frequently been reported. Glioblastoma multiforme (GBM) is the most aggressive (grade IV) and most common form of a malignant brain tumor. Even when aggressive multimodality therapy consisting of radiotherapy, chemotherapy, and surgical excision is used, median survival is only 12–17 months. Standard therapy for glioblastoma multiforme consists of maximal surgical resection of the tumor, followed by radiotherapy between two and four weeks after the surgical procedure to remove the cancer, then by chemotherapy, such as temozolomide. Most patients with glioblastoma take a corticosteroid, typically dexamethasone, during their illness to relieve symptoms. Experimental treatments include targeted therapy, gamma knife radiosurgery, boron neutron capture therapy and gene therapy. Oligodendrogliomas are incurable but slowly progressive malignant brain tumors. They can be treated with surgical resection, chemotherapy, radiotherapy or a combination. For some suspected low-grade (grade II) tumors, only a course of watchful waiting and symptomatic therapy is opted for. These tumors show a high frequency of co-deletions of the p and q arms of chromosome 1 and chromosome 19 respectively (1p19q co-deletion) and have been found to be especially chemosensitive with one report claiming them to be one of the most chemosensitive tumors. A median survival of up to 16.7 years has been reported for grade II oligodendrogliomas. Figures for incidences of cancers of the brain show a significant difference between more- and less-developed countries (the less-developed countries have lower incidences of tumors of the brain). This could be explained by undiagnosed tumor-related deaths (patients in extremely poor situations do not get diagnosed, simply because they do not have access to the modern diagnostic facilities required to diagnose a brain tumor) and by deaths caused by other poverty-related causes that preempt a patient's life before tumors develop or tumors become life-threatening. Nevertheless, statistics suggest that certain forms of primary brain tumors are more common among certain populations. The incidence of low-grade astrocytoma has not been shown to vary significantly with nationality. However, studies examining the incidence of malignant central nervous system (CNS) tumors have shown some variation with national origin. Since some high-grade lesions arise from low-grade tumors, these trends are worth mentioning. Specifically, the incidence of CNS tumors in the United States, Israel, and the Nordic countries is relatively high, while Japan and Asian countries have a lower incidence. These differences probably reflect some biological differences as well as differences in pathologic diagnosis and reporting. Worldwide data on incidence of cancer can be found at the WHO (World Health Organisation) and is handled by the IARC (International Agency for Research on Cancer) located in France. Brain, other CNS or intracranial tumors are the ninth most common cancer in the UK (around 10,600 people were diagnosed in 2013), and it is the eighth most common cause of cancer death (around 5,200 people died in 2012). In the United States more than 28,000 people under 20 are estimated to have a brain tumor. About 3,720 new cases of brain tumors are expected to be diagnosed in those under 15 in 2019. Higher rates were reported in 1985–1994 than in 1975–1983. There is some debate as to the reasons; one theory is that the trend is the result of improved diagnosis and reporting, since the jump occurred at the same time that MRIs became available widely, and there was no coincident jump in mortality. They are 20–25 percent of cancers in children. The average survival rate for all primary brain cancers in children is 74%. Brain cancers are the most common cancer in children under 19, are result in more death in this group than leukemia. Younger people do less well. The most common brain tumor types in children (0-14) are: pilocytic astrocytoma, malignant glioma, medulloblastoma, neuronal and mixed neuronal-glial tumors, and ependymoma. In children under 2, about 70% of brain tumors are medulloblastomas, ependymomas, and low-grade gliomas. Less commonly, and seen usually in infants, are teratomas and atypical teratoid rhabdoid tumors. Germ cell tumors, including teratomas, make up just 3% of pediatric primary brain tumors, but the worldwide incidence varies significantly. In the UK, 429 children aged 14 and under are diagnosed with a brain tumour on average each year, and 563 children and young people under the age of 19 are diagnosed. Cancer immunotherapy is being actively studied. For malignant gliomas no therapy has been shown to improve life expectancy as of 2015. In 2000, researchers used the vesicular stomatitis virus, or VSV, to infect and kill cancer cells without affecting healthy cells. Led by Prof. Nori Kasahara, researchers from USC, who are now at UCLA, reported in 2001 the first successful example of applying the use of retroviral replicating vectors towards transducing cell lines derived from solid tumors. Building on this initial work, the researchers applied the technology to in vivo models of cancer and in 2005 reported a long-term survival benefit in an experimental brain tumor animal model. [unreliable medical source?] Subsequently, in preparation for human clinical trials, this technology was further developed by Tocagen (a pharmaceutical company primarily focused on brain cancer treatments) as a combination treatment (Toca 511 & Toca FC). This has been under investigation since 2010 in a Phase I/II clinical trial for the potential treatment of recurrent high-grade glioma including glioblastoma multiforme (GBM) and anaplastic astrocytoma. No results have yet been published. Pituitary adenomas ("pituitary tumours") are sometimes incorrectly referred to as a brain tumours. This is perhaps because the pituitary gland is in the skull, however it is not part of the brain. Pituitary adenomas are rarely cancerous. ^ a b c d e f g h i j k l m n o p "Adult Brain Tumors Treatment". NCI. 28 February 2014. Archived from the original on 5 July 2014. Retrieved 8 June 2014. ^ a b c d e f g h i j k l m n o p "General Information About Adult Brain Tumors". NCI. 14 April 2014. Archived from the original on 5 July 2014. Retrieved 8 June 2014. ^ a b c d e f g h i j "Chapter 5.16". World Cancer Report 2014. World Health Organization. 2014. ISBN 978-9283204299. Archived from the original on 19 September 2016. ^ a b "SEER Stat Fact Sheets: Brain and Other Nervous System Cance". NCI. Archived from the original on 6 July 2014. Retrieved 18 June 2014. ^ Longo, Dan L (2012). "369 Seizures and Epilepsy". Harrison's principles of internal medicine (18th ed.). McGraw-Hill. p. 3258. ISBN 978-0-07-174887-2. ^ a b Merrel RT (December 2012). "Brain tumors". Disease-a-Month. 58 (12): 678–89. doi:10.1016/j.disamonth.2012.08.009. PMID 23149521. ^ World Cancer Report 2014. World Health Organization. 2014. pp. Chapter 1.3. ISBN 978-9283204299. ^ "Brain Tumour Facts 2011" (PDF). Brain Tumour Alliance Australia. Archived from the original (PDF) on 25 January 2014. Retrieved 9 June 2014. ^ "Brain Tumors". Archived from the original on 12 August 2016. Retrieved 2 August 2016. ^ a b "Mood Swings and Cognitive Changes | American Brain Tumor Association". www.abta.org. Archived from the original on 2 August 2016. Retrieved 3 August 2016. ^ "Coping With Personality & Behavioral Changes". www.brainsciencefoundation.org. Archived from the original on 30 July 2016. Retrieved 3 August 2016. ^ a b c d Kahn, Kevin; Finkel, Alan (June 2014). "It IS a tumor -- current review of headache and brain tumor". Current Pain and Headache Reports. 18 (6): 421. doi:10.1007/s11916-014-0421-8. ISSN 1534-3081. PMID 24760490. ^ a b c Gregg, N. (2014). "Neurobehavioural Changes In Patients Following Brain Tumour: Patients And Relatives Perspective". Supportive Care in Cancer. ^ a b "Coping With Personality & Behavioral Changes". www.brainsciencefoundation.org. Archived from the original on 30 July 2016. Retrieved 27 July 2016. ^ a b c "Mood Swings and Cognitive Changes | American Brain Tumor Association". www.abta.org. Archived from the original on 15 August 2016. Retrieved 27 July 2016. ^ Warnick, MD, Ronald (August 2018). "Brain Tumors: an introduction". Mayfield Brain and Spine Clinic. Retrieved 6 March 2019. ^ "Changes in Vision - Brain Tumour Symptoms". www.thebraintumourcharity.org. Retrieved 9 February 2018. ^ a b "Brain Tumors". Children's Hospital of Wisconsin. 6 March 2019. ^ a b c Jones, Caleb. "Brain Tumor Symptoms | Miles for Hope | Brain Tumor Foundation". milesforhope.org. Archived from the original on 14 August 2016. Retrieved 3 August 2016. ^ Krishnatreya, M; Kataki, AC; Sharma, JD; Bhattacharyya, M; Nandy, P; Hazarika, M (2014). "Brief descriptive epidemiology of primary malignant brain tumors from North-East India". Asian Pacific Journal of Cancer Prevention. 15 (22): 9871–73. doi:10.7314/apjcp.2014.15.22.9871. PMID 25520120. ^ Kleihues P, Ohgaki H, Eibl RH, Reichel MB, Mariani L, Gehring M, Petersen I, Höll T, von Deimling A, Wiestler OD, Schwab M (1994). "Type and frequency of p53 mutations in tumors of the nervous system and its coverings". Molecular Neuro-oncology and Its Impact on the Clinical Management of Brain Tumors. Recent results in cancer research. 135. Springer. pp. 25–31. ISBN 978-3540573517. ^ Hodgson TS, Nielsen SM, Lesniak MS, Lukas RV (2016). "Neurological Management of Von Hippel-Lindau Disease". Neurologist (Review). 21 (5): 73–78. doi:10.1097/NRL.0000000000000085. PMID 27564075. ^ Rogers L, Barani I, Chamberlain M, Kaley TJ, McDermott M, Raizer J, et al. (2015). "Meningiomas: knowledge base, treatment outcomes, and uncertainties. A RANO review". J Neurosurg (Review). 122 (1): 4–23. doi:10.3171/2014.7.JNS131644. PMC 5062955. PMID 25343186. ^ Hourigan CS (2006). "The molecular basis of coeliac disease". Clin Exp Med (Review). 6 (2): 53–59. doi:10.1007/s10238-006-0095-6. PMID 16820991. ^ Frei P, Poulsen AH, Johansen C, Olsen JH, Steding-Jessen M, Schüz J (19 October 2011). "Use of mobile phones and risk of brain tumours: update of Danish cohort study". BMJ. 343: d6387. doi:10.1136/bmj.d6387. PMC 3197791. PMID 22016439. ^ "IARC classifies radiofrequency electromagnetic fields as possibly carcinogenic to humans" (PDF). World Health Organization press release N° 208 (Press release). International Agency for Research on Cancer. 31 May 2011. Archived (PDF) from the original on 1 June 2011. Retrieved 2 June 2011. ^ a b Herholz, Karl; Langen, Karl-Josef; Schiepers, Christiaan; Mountz, James M. (2012). "Brain Tumors". Seminars in Nuclear Medicine. 42 (6): 356–70. doi:10.1053/j.semnuclmed.2012.06.001. PMC 3925448. PMID 23026359. ^ a b c d e Iv, Michael; Yoon, Byung C.; Heit, Jeremy J.; Fischbein, Nancy; Wintermark, Max (January 2018). "Current Clinical State of Advanced Magnetic Resonance Imaging for Brain Tumor Diagnosis and Follow Up". Seminars in Roentgenology. 53 (1): 45–61. doi:10.1053/j.ro.2017.11.005. ISSN 1558-4658. PMID 29405955. ^ Margiewicz, Stefan; Cordova, Christine; Chi, Andrew S.; Jain, Rajan (January 2018). "State of the Art Treatment and Surveillance Imaging of Glioblastomas". Seminars in Roentgenology. 53 (1): 23–36. doi:10.1053/j.ro.2017.11.003. ISSN 1558-4658. PMID 29405952. ^ "What you need to know about brain tumors". National Cancer Institute. Archived from the original on 27 January 2012. Retrieved 25 February 2012. ^ Park, Bong Jin; Kim, Han Kyu; Sade, Burak; Lee, Joung H. (2009). "Epidemiology". In Lee, Joung H. (ed.). Meningiomas: Diagnosis, Treatment, and Outcome. Springer. p. 11. ISBN 978-1-84882-910-7. ^ "Classifications of Brain Tumors". AANS. American Association of Neurological Surgeons. Archived from the original on 24 April 2017. Retrieved 23 April 2017. ^ Frappaz D, Mornex F, Saint-Pierre G, Ranchere-Vince D, Jouvet A, Chassagne-Clement C, Thiesse P, Mere P, Deruty R (1999). "Bone metastasis of glioblastoma multiforme confirmed by fine needle biopsy". Acta Neurochirurgica. 141 (5): 551–52. doi:10.1007/s007010050342. PMID 10392217. ^ Nicolato, Antonio; Gerosa, Massimo A.; Fina, Paolo; Iuzzolino, Paolo; Giorgiutti, Fabrizia; Bricolo, Albino (1995). "Prognostic factors in low-grade supratentorial astrocytomas: A uni-multivariate statistical analysis in 76 surgically treated adult patients". Surgical Neurology. 44 (3): 208–21, discussion 221–23. doi:10.1016/0090-3019(95)00184-0. PMID 8545771. ^ Spetzler RF, Sanai N (2012). "The quiet revolution: Retractorless surgery for complex vascular and skull base lesions". Journal of Neurosurgery. 116 (2): 291–300. doi:10.3171/2011.8.JNS101896. PMID 21981642. ^ Paul Brennan (4 August 2008). "Introduction to brain cancer". cliniclog.com. Archived from the original on 17 February 2012. Retrieved 19 December 2011. ^ "Radiosurgery treatment comparisons – Cyberknife, Gamma knife, Novalis Tx". Archived from the original on 20 May 2007. Retrieved 22 July 2014. ^ "Treating secondary brain tumours with WBRT". Cancer Research UK. Archived from the original on 25 October 2007. Retrieved 5 June 2012. ^ "Whole Brain Radiation increases risk of learning and memory problems in cancer patients with brain metastases". MD Anderson Cancer Center. Archived from the original on 5 October 2008. Retrieved 5 June 2012. ^ "Metastatic brain tumors". International RadioSurgery Association. Archived from the original on 16 June 2012. Retrieved 5 June 2012. ^ "How Our Patients Perform: Glioblastoma Multiforme". UCLA Neuro-Oncology Program. Archived from the original on 9 June 2012. Retrieved 5 June 2012. ^ Dalvi A. "Normal Pressure Hydrocephalus Causes, Symptoms, Treatment". eMedicineHealth. Emedicinehealth.com. Archived from the original on 22 February 2012. Retrieved 17 February 2012. ^ "Brain Stem Gliomas in Childhood". Childhoodbraintumor.org. Archived from the original on 9 March 2012. Retrieved 17 February 2012. ^ Sasmita, Andrew Octavian; Wong, Ying Pei; Ling, Anna Pick Kiong (1 February 2018). "Biomarkers and therapeutic advances in glioblastoma multiforme". Asia-Pacific Journal of Clinical Oncology. 14 (1): 40–51. doi:10.1111/ajco.12756. ISSN 1743-7563. PMID 28840962. ^ "GBM Guide – MGH Brain Tumor Center". Brain.mgh.harvard.edu. Archived from the original on 16 February 2012. Retrieved 17 February 2012. ^ Chien-Kuo Tai; Noriyuki Kasahara (1 January 2008). "Replication-competent retrovirus vectors for cancer gene therapy" (PDF). Frontiers in Bioscience. 13 (13): 3083–95. doi:10.2741/2910. PMID 17981778. Archived from the original (PDF) on 19 March 2012. ^ Murphy AM, Rabkin SD (April 2013). "Current status of gene therapy for brain tumors". Transl. Res. 161 (4): 339–54. doi:10.1016/j.trsl.2012.11.003. PMC 3733107. PMID 23246627. ^ Ty AU, See SJ, Rao JP, Khoo JB, Wong MC (January 2006). "Oligodendroglial tumor chemotherapy using "decreased-dose-intensity" PCV: a Singapore experience". Neurology. 66 (2): 247–49. doi:10.1212/01.wnl.0000194211.68164.a0. PMID 16434664. Archived from the original on 20 July 2008. ^ "Neurology". Neurology. Archived from the original on 19 February 2012. Retrieved 17 February 2012. ^ Bondy ML, Scheurer ME, Malmer B, et al. (2008). "Brain Tumor Epidemiology: Consensus from the Brain Tumor Epidemiology Consortium (BTEC)". Cancer. 113 (7 Suppl): 1953–68. doi:10.1002/cncr.23741. PMC 2861559. PMID 18798534. ^ a b c "Cancer Stat Facts: Brain and Other Nervous System Cancer". National Cancer Institute. 31 March 2019. ^ Jallo GI, Benardete EA (January 2010). "Low-Grade Astrocytoma". Archived from the original on 27 July 2010. ^ "CANCERMondial". International Agency for Research on Cancer. Archived from the original on 17 February 2012. Retrieved 17 February 2012. ^ a b "What are the key statistics about brain and spinal cord tumors?". American Cancer Society. 1 May 2012. Archived from the original on 2 July 2012. ^ "2018 CBTRUS Fact Sheet". Central Brain Tumor Registry of the United States. 31 March 2019. ^ "Brain, other CNS and intracranial tumours statistics". Cancer Research UK. Archived from the original on 16 October 2014. Retrieved 27 October 2014. ^ a b "Quick Brain Tumor Facts". National Brain Tumor Society. Retrieved 14 February 2019. ^ "CBTRUS - 2018 CBTRUS Fact Sheet". www.cbtrus.org. Retrieved 14 February 2019. ^ Chamberlain MC, Kormanik PA (February 1998). "Practical guidelines for the treatment of malignant gliomas". West. J. Med. 168 (2): 114–20. PMC 1304839. PMID 9499745. ^ "Childhood Brain Cancer Now Leads to More Deaths than Leukemia". Fortune. Retrieved 14 February 2019. ^ Gurney JG, Smith MA, Bunin GR. "CNS and Miscellaneous Intracranial and Intraspinal Neoplasms" (PDF). SEER Pediatric Monograph. National Cancer Institute. pp. 51–57. Archived (PDF) from the original on 17 December 2008. Retrieved 4 December 2008. In the US, approximately 2,200 children and adolescents younger than 20 years of age are diagnosed with malignant central nervous system tumors each year. More than 90 percent of primary CNS malignancies in children are located within the brain. ^ Rood BR. "Infantile Brain Tumors". The Childhood Brain Tumor Foundation. Archived from the original on 11 November 2012. Retrieved 23 July 2014. ^ Echevarría ME, Fangusaro J, Goldman S (June 2008). "Pediatric central nervous system germ cell tumors: a review". Oncologist. 13 (6): 690–99. doi:10.1634/theoncologist.2008-0037. PMID 18586924. ^ "About childhood brain tumours". Archived from the original on 7 August 2016. Retrieved 16 June 2016. ^ Bloch, O (2015). Immunotherapy for malignant gliomas. Cancer Treatment and Research. 163. pp. 143–58. doi:10.1007/978-3-319-12048-5_9. ISBN 978-3-319-12047-8. PMID 25468230. ^ Auer R, Bell JC (January 2012). "Oncolytic viruses: smart therapeutics for smart cancers". Future Oncology. 8 (1): 1–4. doi:10.2217/fon.11.134. PMID 22149027. ^ Garber K (1 March 2006). "China Approves World's First Oncolytic Virus Therapy For Cancer Treatment". J Natl Cancer Inst. 98 (5): 298–300. doi:10.1093/jnci/djj111. PMID 16507823. Archived from the original on 10 June 2013. ^ Logg CR, Tai CK, Logg A, Anderson WF, Kasahara N (20 May 2001). "A uniquely stable replication-competent retrovirus vector achieves efficient gene delivery in vitro and in solid tumors". Human Gene Therapy. 12 (8): 921–32. doi:10.1089/104303401750195881. PMID 11387057. ^ Tai CK, Wang WJ, Chen TC, Kasahara N (November 2005). "Single-shot, multicycle suicide gene therapy by replication-competent retrovirus vectors achieves long-term survival benefit in experimental glioma". Molecular Therapy. 12 (5): 842–51. doi:10.1016/j.ymthe.2005.03.017. PMID 16257382. Archived from the original on 12 September 2010. ^ "A Study of a Retroviral Replicating Vector Administered to Subjects With Recurrent Malignant Glioma". Clinical Trials.gov. July 2014. Archived from the original on 26 November 2011. Wikimedia Commons has media related to Brain neoplasms.